While my wife was in our local butchers my attention was caught by the cobbled alleyway to one side of the shop. The shop's rear windows were curiously different heights from the ground, an old cast-iron downpipe added a pleasing vertical element and an ancient bicycle leaned against the opposite wall. Of that scene only the windows and downpipe remain in this drawing but the feeling lives on. All that remained was to find the dogs. 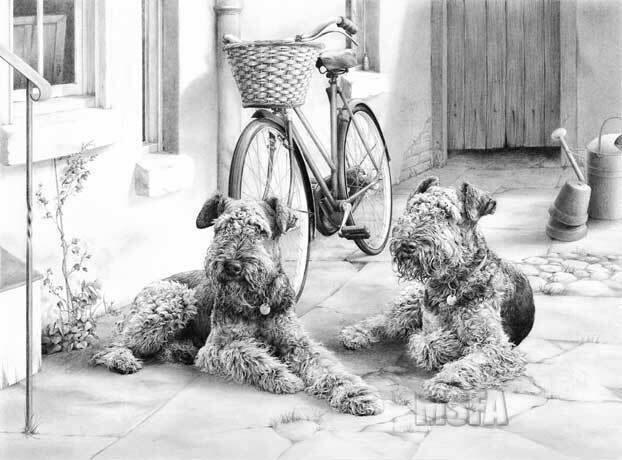 Just a short time later, while walking through the market square, I was attracted to a beautiful pair of Airedale Terriers. They had such presence and a feeling of in-built fun. We photographed them a week later as they played with their owner's guinea pigs and rabbits on the lawn. The original drawing took 172 hours to complete and is now in a private collection in the USA.